It was a beautiful day in Humboldt County with clear blue skies and temperatures in the low 70’s. 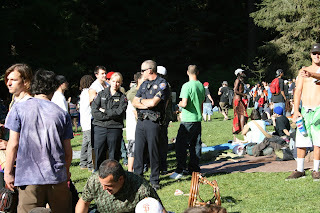 On April 20 I observed hundreds of people walking, some with backpacks headed up the hill toward the Community Redwood Park in Arcata. Where was everyone going I wondered? My curiosity got the best of me so I headed up to the park. I drove around near the park and realized that getting a parking place would be like winning the lottery. I eventually parked downtown a mile away and walked up the hill which I thought would be good exercise and it was. 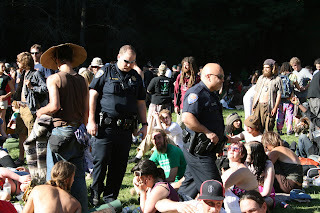 A policeman parked along the sidewalk with his window opened gave me an opportunity to ask him what was going on up in the park. I found out later that there was one portable latrine and no food being sold and the folks selling bottled water for $1.00 were doing it illegally. Entering the park was like night and day from the sunny house lined streets to the fern lined winding trail leading to a large grassy open area. I could hear the drum beats and the increasingly louder murmur of people who had gathered there to celebrate this unforgettable occasion. 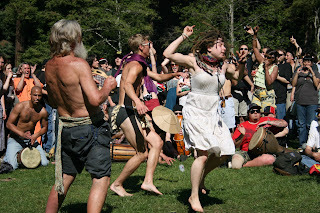 The annual Cannabis Festival attracted people young and old,from far and near and it brought back memories of a similar event that I experienced in Golden Gate Park, San Francisco in 1967 called the “Human Be in”. The S.F. event was more spectacular with 100,000 in attendance. 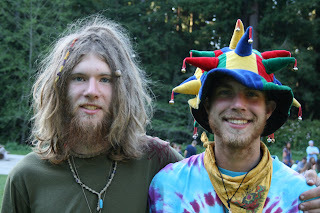 The Grateful Dead appeared there along with Timothy Leary and Allen Ginsberg. 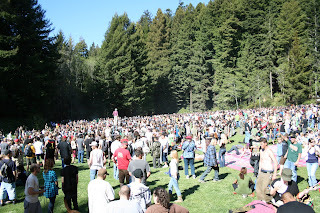 Over a thousand gathered in Redwood park, Arcata CA. 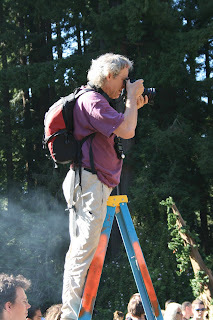 Photographer Nick Nichols on ladder in the center of the crowd. (above person with red shirt.) CLICK ON PHOTOS TO ENLARGE. The distinctive odor of “grass” wafted through the smoke filled air giving new meaning to “second hand” smoke. 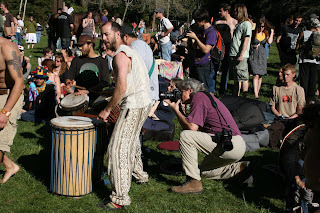 I worked my way to the center of the activity where the bongo drummers and dancers were entertaining the crowd. 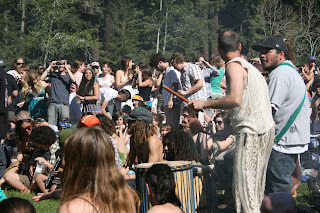 The beat was infectious but the crowd was mostly subdued, laid back, and the majority were stoned. 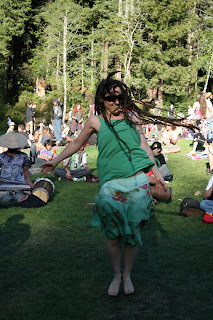 The dancers had endless energy with free and extemporaneous motion for over an hour without a break. 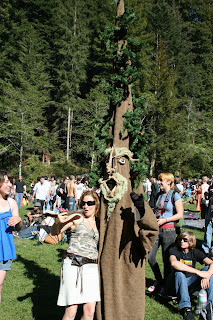 A person in a Redwood Tree Costume moving to the beat of the music paused for a moment to pose with a pipe smoker. 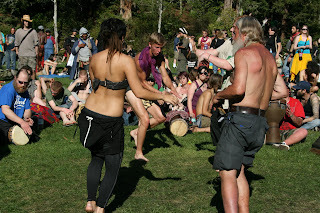 A guy in a “zone” dancing wildly in his underwear and a young girl and a old codger each with moves that flowed freely to the cadence of the drums. A couple of people asked me what I was going to do with the photos and I told them that they didn’t have to worry because they definitely wouldn’t be on the cover of National Geographic Magazine. 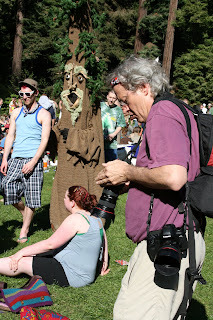 He told me that his photos would appear in the October issue of the magazine in an article on the Redwoods. I followed Nick for awhile photographing him during his relentless pursuit of that special moment for people all over the world to see. 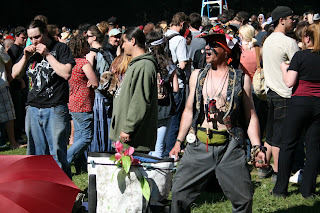 This guy was feeling the scene and posing for the camera. Meanwhile the local police were keeping the peace! 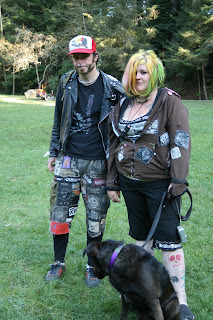 My guess is that they had nothing better to do and happy that it was a peaceful event. Having said that, I would add that they were very effective in controlling those that were inebriated before they arrived and thus prevented a unfavorable disruption of this otherwise peaceful event. Nick Nichols (Kneeling below)continued his quest for that memorable shot from a different angle. 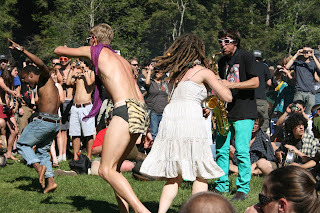 It was a "people watchers" dream featuring a wide range of folks making a statement with their appearance. 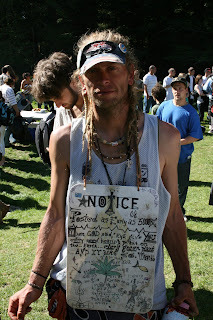 "Four Twenty was a unique cultural event that I was glad to have made the effort to experience and document. Nick Nichols checking his photos on one of his Canon Digital SLR cameras. Perhaps one day when the people of California realize the tax benefits that would come with the legalization of Marijuana this event will become "sanctioned" by the city. 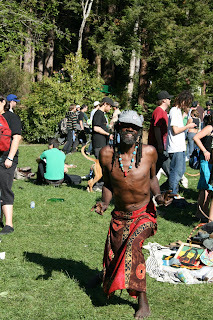 Vendors could then sell art,food,juice,tea and water. Would have liked to have been there if to only breath the air. What a great description of such a unique event. Thanks Terry for taking the time to draw out the beauty and strangeness of something uniquely American. Thanks for the possitive remarks Greg. 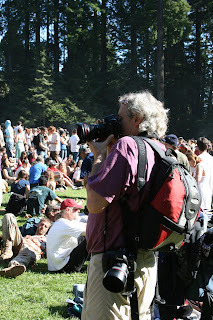 It will be interesting to see the photos that Nick Nichols took of the event and publishes in Nat. Geographic. great Blog! This looks like an interesting way to spend a day! I would love to have been there ! Suzy yes it was one of the most interesting days that I can remember. Would have liked to have been there if to only breath the air. Such a liberal affair Nobody should care.